At the January club meeting we celebrated the birthdays of Channing Brown, Daiva Markelis, and Stevie Momaly with special prizes and three different cakes! 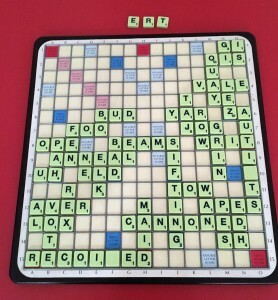 The weather was relatively mild and there were seventeen participants, with Champaign and Danville each being well represented by several players and Indiana, the state where the National Scrabble Championships will be held in August (in Fort Wayne), being very ably represented by Barbara Dixon! Tootsie Hamburg of Danville made the play of the day, WABBLED (an alternate spelling of wobbled) for 85 points, on her way to winning all four of her games! CLINKERS (a verb meaning “makes furnace slag”) was another one of the five total bingos Tootsie produced this day! Interesting plays by others included REPASTED (which means “partook of a meal”, not to paste again) by Barbara, OUTASKS by Daiva, GUSTILY (anagram of GUTSILY) by Channing, STYMIES and VARSITY by Lisa Lovelace, and FENNIER and LORNEST (newly acceptable) by Mary Maddox. 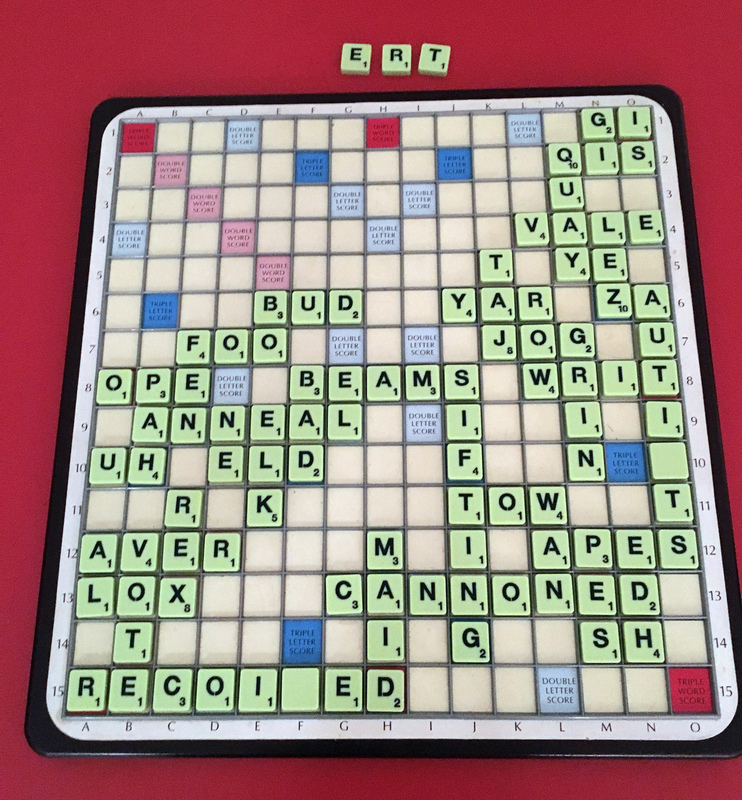 The February club meeting was held on an atypical 65 degree day, rather than on a day with more typically seasonal “Scrabble weather” (i.e., the kind where you might as well be inside playing Scrabble). This time we celebrated the birthday of Angela Vietto with special prizes and cake. Unlike the previous month there was an abundance of suitable candidates for the traditional “descriptive word” prizes given in honor of the birthday person. Angela chose FOX, played by Dagni Bredeson, VIXEN, played by Tootsie, and CRAZY, played by Cheryl Hawker and by Lisa, as being prize worthy. Angela noted she became fond of those words after learning in the course of her studies that vixen has transformed over the years from its original form of “fixen”, which was derived from the word fox! Apparently, Angela is not only crazy as one but also smart as a fox! Daiva won all four of her games at this meeting due to outstanding plays such as ANATASE (a mineral) for 68 points and GESTATED for 86. Foxy Angela made VITIATE (to impair the value or quality of) for 76 as well as AUTISTS (ones who suffer from autism) for 78, the latter play coming in a very well-played 423-456 loss to Mary, who played CANNONED (anagram of NONDANCE) for 82 on her way to victory. And Lisa successful played TARPOOL* for 72 points (a phony word, though CARPOOL, VANPOOL, CESSPOOL, and SESSPOOL are all acceptable). Previous post: Awards for 2015!